It has been sort of a strange week. Half the staff (Wayne, Chuck, Kathy) are either out sick or here working at half their usual capacity. As a result, everyone has been keeping to themselves, locked away in their rooms, coughing and feeling worn out. So far, I have somehow managed to escape the plague outbreak. Fingers crossed that things stay that way. There are a lot products in the pipeline and all are moving forward, so I’m not sure why I am feeling frustrated and a little down this week. Probably because I’ve been steeped in paperwork and bookkeeping matters most of the week when I want (and need) to be writing. It may also be that I’ve worked too many weekends without a break and the fact that we’ve been flying high and working at top speed since Gen Con. You just can’t keep up that pace indefinitely. I wish you could. It didn’t help that our air conditioning went on Wednesday morning. A 90+ degree day no less, and the frozen air conditioning line sent a steady stream into the ceiling tiles of my office. One tile got so soaked it came crashing down, and drenched part of my couch and the paperwork laying on it. The most frustrating part of this being we had this same issue only 5-6 weeks ago and had it supposedly been repaired. I was out of the office much of Wednesday, so I was not present to recognize the water issue. Wahhh. Yesterday was another hot and humid day, making work at the office miserable despite an array of fans going. I actually have one of the repair people here as I write this. I hope it is an easy, inexpensive repair. Both of the Rifts® Poker Decks are gorgeous and fun, and continue to sell like crazy. Nice. And remember Rifts® Savage Worlds Kickstarter supporters, the two Rifts® Poker Decks are now available as add-ons for Rifts® Savage World Kickstarter backers. The two Rifts® Poker Decks have been selling like lightning, with a restock order arriving the morning right after we sold out the initial run of 150 decks! Whew. Talk about perfect timing. We’ll keep a close eye on stock and keep placing orders as necessary so we do not run out of stock. 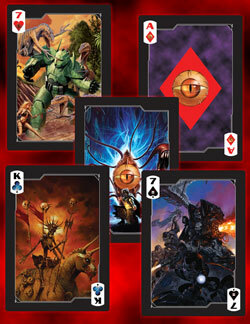 Both sets of Rifts® playing cards appeal to Rifts® gamers and collectors, as well as to Savage Worlds players who use them as dynamic and attractive Action Decks. Each card in both decks has fan fave iconic images from covers and illustrations in the Rifts® game series. If you want something that visually summarizes Rifts® with powerful images of iconic characters, mecha and monsters, then these playing cards are a must for you. They also make nice gifts, playing cards, or additions to your Rifts® collection. 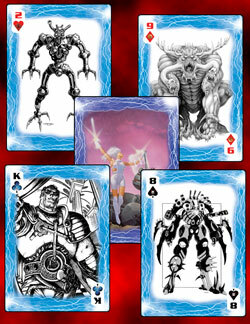 Both decks are available from Palladium Books in attractive, full color, tuck boxes – right now. Rifts® Poker Deck Number One (color) – $11.99 – Cat. No. 2575 – available now. Rifts® Poker Deck Number Two (line art) – $11.99 – Cat. No. 2576 – available now. Remember, only 150 of Rifts® Dimension Book: Secrets of the Atlanteans™ and Rifts® World Book: The Sovietski™ were printed as limited edition, advance previews of the complete, submitted manuscript for these two books. Both are available on a first come, first served basis while supplies last. Additional material may be added and some of it tweaked, but these are the core of the books. Atlanteans presents background on the Atlantean tribes and the addition of Crystal Magic and Shadow Magic. Less than three dozen copies remain! The Sovietski™ is the bigger of the two books and presents the Sovietski power bloc in Rifts Russia. You get the setting and culture, bionics, cyborgs and the Russian war machine. This title is selling fast. Available on a first come, first served basis, while supplies last. See the full description elsewhere in this Update. Limited to 150 copies – more than two-thirds already sold! I was speaking with my friend, Todd, last Sunday and brought him up to speed about what Rifts® CS Heroes of Humanity, CS Arsenal and The Disavowed are laying the groundwork for. Like the few dozen people before him, he was wowed and excited about the prospects and called me up a few days later to offer some suggestions. Yeah, five days later and he was still excited and thinking about HoH and what’s coming next year. The big reveal will happen in early 2017, but CS Arsenal and The Disavowed present the foundation and hint at the epic things to come. I will be assigning the artwork over the next week. 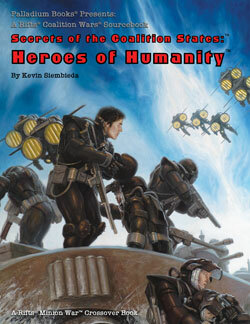 Speaking of Rifts® CS Heroes of Humanity™, I cannot encourage you enough to get this book. 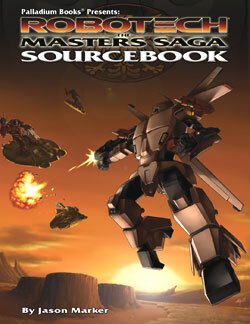 Not just because it plays a pivotal role in the future of Rifts® North America, but because is it one fun sourcebook, with new insights about the CS, its growing war machine, the use of CS Demon Slayers, Juicers and Combat Cyborgs like never before, ways to change and improve your existing Men-at-Arms characters, the magnitude and scope of the demon plagues, Demon and CS strategies and tactics, and more. Available now. Jazzy Johnny Z should be finishing up the cover soon and Ben Rodriguez turned in his first batch of new Atlantean Magic Tattoos. 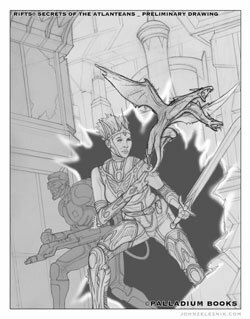 Oh man, I need to assign out the rest of the art for this book in the next week or two. I gave artist Mark Dudley a copy of the Raw Edition Sovietski to look over and select the pieces of art he would like to illustrate for this book. As soon as he gets back to me about which illustrations he’s doing, I will assign the rest to other artists. 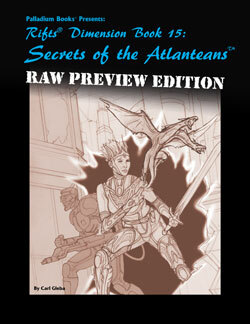 John Zeleznik will work on the cover painting as soon as he is finished with the cover for Secrets of the Atlanteans. The PDFs of Wave 2 cards will be posted on DriveThruRPG.com at a rate of 2 a day until they are ALL posted and available to you over the next several weeks. Wayne and I had a promising discussion with a gentleman if we decide to go one way with manufacturing, and we are waiting on a quote for another. We think the latter is even more promising. We also met with our UPS rep to try to establish UPS as an additional international shipper for all our products, for both individuals placing orders and freight. They claim to be highly competitive. We’ll find out in the weeks ahead. Working on it! Another great issue. The Rifter® #74 is available now. HoH CS Arsenal™ and several other titles in the pipeline are all in various stages of final development or production. Boy are we busy. I have artists already working on aspects of Secrets of the Atlanteans™, Sovietski™, Garden of the Gods™ (Palladium Fantasy®) and Hell Followed™ (for Dead Reign®), among others. The Rifter® #67 has been added this week as we try to get back to a book a week schedule. Rifts® World Book 30: D-Bees of North America™ was added last week. Robotech® RPG Tactics™ Wave 2 stat cards are being released at a rate of two per day starting next week. All of it adds to the growing list of Rifts®, Robotech® and other Palladium RPG game titles available as PDF books, cards and support. A title should be getting added every week or two through the end of the year, so watch for them. Robotech® RPG Tactics™ Wave 2 Paper Game Pieces, and now Wave 2 stat cards, join Rifts® Ultimate Edition and 160+ other PDF Palladium titles, RRT stuff, G.M. helper kits and free material on DriveThruRPG.com right now! More Rifts®, Robotech® and other Palladium game titles, paper miniatures and fun coming to PDF in the weeks and months ahead. Watch for them. Recent PDF titles include Rifts® Ultimate Edition, Rifts® World Book 30: D-Bees of North America, Rifts® World Book 29: Madhaven™, Rifts® World Book 28: Arzno™, Rifts® World Book 27: Adventures in Dinosaur Swamp, Rifts® World Book 26: Dinosaur Swamp, World Book 25: Rifts® China Two, and World Book 24: Rifts® China One, among many, many others. There are also previews of Rifts® CS Heroes of Humanity™, The Rifter® #73, Northern Gun 1 & 2, Lemuria, Rifts® Vampire Kingdoms, Bizantium and many other Palladium titles. Check back every week to see which new PDFs of Rifts® World Books and other titles have been added! Rifts® Ultimate Edition, Rifts® World Book 30: D-Bees of North America™, Rifts® World Book 29: Madhaven™, Rifts® World Book 28: Arzno™, Rifts® World Book 27: Adventures in Dinosaur Swamp™, Rifts® World Book 26: Dinosaur Swamp, Rifts® World Book 25: China Two, Rifts® World Book 24: China One, Rifts® World Book 23: Xiticix Invasion, Rifts® World Book 22: Free Quebec, Rifts® World Book 21: Splynn Dimensional Market, Rifts® World Book 20: Canada, Rifts® World Book 19: Australia, Rifts® World Book 18: Mystic Russia, Rifts® World Book 17: Warlords of Russia, Rifts® World Book 16: Federation of Magic, Rifts® World Book 15: Spirit West, Rifts® World Book 14: New West™, Rifts® World Book 13: Lone Star™, Rifts® World Book 12: Psyscape™, Rifts® World Book 11: Coalition War Campaign™, Rifts® World Book 10: Juicer Uprising™, and Rifts® World Book 9: South America 2 along with World Books #1-8 and various other Rifts® titles. Much more to come in the weeks ahead. Alex put more Palladium hardcovers and out of print titles, including old TMNT books (in mint condition), along with Kevin Siembieda artwork and collectibles in my online store this week with more coming! I hope you enjoy these unique proofreader copies, out of print books, signed titles, rare hardcovers, original artwork, toys or other goodies. Original art is one-of-a-kind items, so when they are gone (like the TMNT sketches and Rifts® illustrations), they are gone. Many other offerings are signed, limited editions or are items that have been sold out for some time. I will continue to pull things out of my personal collection and Palladium archives and make them available. A bunch of toys have already been added to my online store with more to come. More collectibles, artwork and toys are added almost every week. Palladium collectibles, hardcovers (BTS, Lemuria, Rifts® Silver, RUE Gold, etc. ), out-of-print titles, original artwork, and toys and items from my personal collection are on my ebay store. We add items on a regular basis and offer sales, so check it out from time to time. Includes one-of-a-kind original artwork, prints, Rifts® and Robotech® artwork by Kevin Long, me and others. There is also a range of limited editions, rare book titles and limited edition hardcovers, toys and more available with frequent new items added. Items include original art, out-of-print titles, redlined proofreader photocopies signed by me and the staff, signed manuscripts with editors’ corrections, some original art, hardcover books (including Rifts® Lemuria, Northern Gun™ One, Northern Gun™ Two, Megaverse® in Flames™, Beyond the Supernatural™ Gold, Rifts® Machinations of Doom™ Gold and Rifts® Ultimate Gold), hundreds of toys and action figures, all from my personal archives and collection. Take a look every weekend or two for new items added. GrandCon is a gaming convention in Michigan that is happening in just 3 weeks! It is a growing gaming and media convention that gets 2,000-3,000 people. Sean Patrick Fannon and I (Kevin Siembieda) – among others – are guests and hosting games and panel talks. Get the latest scoop on Rifts® Savage Worlds and Palladium Books. Palladium has a booth in the Dealers’ Room too, with the Rifts® Poker Decks and a selection of Rifts®, Robotech®, RRT and other Palladium products, along with some original Chuck Walton art. The booth is manned by Wayne Smith and Charles Walton II, so come on down to say hello, chat and get autographs, and buy Palladium products. I am running a Lord DeSilca/Fantasy and/or a Beyond the Supernatural gaming event or two. Not sure what Sean has planned. With GrandCon right here in Grand Rapids, Michigan, I hope to see fans from across Michigan and maybe even from Illinois, Indiana and maybe even Wisconsin and eastern Iowa. I (Kevin Siembieda) will be attending Gulf Con along with Sean Patrick Fannon, the core writer and architect of Rifts® Savage Worlds®, in Mississippi in March, 2017. Gulf Con and Gen Con are the only two conventions I will be attending in 2017; that’s how busy I expect to be banging out new gaming product. Some things that will shock and amaze too. I hope to see and chat with a lot of Palladium and Pinnacle fans. Bring books for me and Sean to sign. 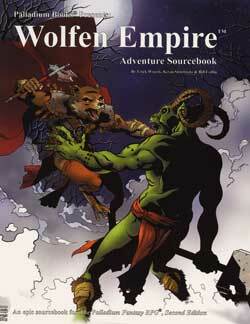 I continue to approve art for Rifts® Savage Worlds® adventure sourcebooks. I have pages of text to review as well. Will try to get to it tomorrow. All good stuff. Boy, am I tired of shuffling papers around. Much of this week was spent on the phone, in meetings and finishing up bookkeeping and paperwork. Years of it, as I completely reorganized my room and sorted through mountains of old and current paperwork, correspondences, contracts, files and other documents. The paperwork end of things was time consuming and not fun for me, but I think I’m pretty much done with it, at last. The phone calls and meetings were a bit more fun because they largely involved plotting and coordinating new releases, and scheduling and exploring some new possibilities for the future. Can’t wait to get back to the creative work of writing and assigning out artwork. Working at least part of the weekend to keep things moving. I just got the news that the air conditioning unit may not be worth repairing. Landlord wants a second opinion. All this means we may be out of air conditioning for the next week or so. Ugh. Today is not too bad. It is only supposed to hit 85 degrees Fahrenheit and humidity levels are a bit down. When I got in at 7:45 this morning it was only in the 60s, so I opened up all the doors in the warehouse and office and got fans running. Turned out to be a good move as the inside temp is holding at a survivable 76 degrees in here at the moment. The fans help a lot. Looking at a hot weekend, though. Oh well. I hope you guys and gals have the opportunity to enjoy these fleeting summer weekends whether it is gaming, barbecuing or fun at the beach. And avoid that terrible cold or flu that’s going around. 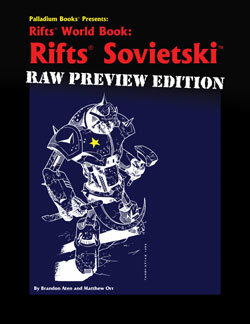 The Raw Preview Edition of Rifts® Sovietski™ is an advance copy of the unedited, unillustrated, final working manuscript for this exciting new sourcebook. You get to see the unfinished book months before the final title is released. A rare look at the raw manuscript before publication. Limited to a total of 150 copies. Contains background information on the fledgling Sovietski and notable cities and people, bunker creation tables, Deadzone Tables, Spetznaz Special Forces, the Soviet Army and its weapons, cyborgs, new bionics, 21 new combat vehicles, Russian D-Bees and more. Note: The finished Rifts® Sovietski™ is anticipated to ship by the end of this year. However, with all the art that is needed, it might slip into an early 2017 release. But you can start playing right now with this special edition! Limited collector’s edition – only 150 total copies made – half of those already sold! $24.99 – Cat. No. 891-RAW – available now, while supplies last. Do not miss out. The Raw Preview Edition of Rifts® Dimension Book: Secrets of the Atlanteans™ is an advance copy of the unedited, unillustrated, final working manuscript for this exciting new sourcebook. You get to see the unfinished book months before the final title is released. A rare look at the raw manuscript before publication. Limited to a total of 150 copies. Filled with never before seen information on the Sunaj and other Atlantean tribes, plus dimensional havens, Crystal and Shadow Magic, the Shadow Dimension, stone pyramids and more. Note: The finished Secrets of the Atlanteans™ is expected to ship in the fall of 2016. $19.99 – Cat. No. 890-RAW – Available now, while supplies last. NEW! The Rifter® #74 – Now available! Rifts®, Splicers® and more awaits you in The Rifter® #74. And some material is official. Every issue of The Rifter® is an idea factory for players and Game Masters to generate new ideas and find new avenues of adventure. It provides useful, ready-to-go source material you can just drop into your ongoing games. A doorway to new possibilities and numerous Palladium role-playing worlds. And the many new characters, O.C.C.s, powers, magic, weapons, villains, monsters, adventures and ideas for one setting can be easily adapted to any Palladium setting. Every issue has material for Rifts® and at least 2-3 other Palladium game lines. And don’t forget, most of the material can be easily adapted for use in ANY Palladium game setting. Rifts® – The Town of Moorcroft™, by Julius Rosenstein – “official” source material. The Town of Moorcroft is not on most maps for a reason: most people don’t even know it exists, or that it rests on a Hidden Rift. Read about the town’s unique history, its Nexus Born, and key places and people. Makes a great location for player groups to rest, trade goods and find adventure. Splicers® – I am Legion, Part Three, by Charles Walton II, Chris Kluge and Lance Colley – adventure plus “official” source material. The adventure continues as your heroes must deal with the new Machine personality known as Legion. In this adventure, the player group discovers a secret weapon facility of the Resistence. They will be introduced to a wide array of new Bio-Tech Weapons and Enhancements to prepare them for the ultimate showdown with Legion! Rifts® – A Town in the Pecos Empire™, by Brett Caron. Heroes Unlimited – The Ancient Weapon Master: Specialist, by Robert Daley Jr.
Rifts® short story – Acceptance, by S.E. Gibbons. A Rifts® cover by Apollo Okamura. 96 pages – $13.95 retail – Cat. No. 174. Available now. 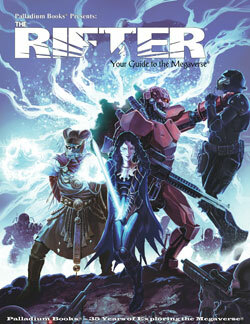 Rifts®, Splicers®, mutants and much more awaits you in The Rifter® #75. Splicers® – I am Legion, Part Four, by Charles Walton II, Chris Kluge and Lance Colley – adventure and “official” source material. The adventure continues as the heroes fight to thwart Legion’s plans and to rescue human prisoners. Many shocking reveals. After the Bomb® with more mutant animal mayhem. Maybe some Dead Reign® or Fantasy material and more. 96 pages – $13.95 retail – Cat. No. 175. In final production. Ships in August (tentative). 160 pages – $20.95 retail – Cat. No. 889. Available now! The name, CS Heroes of Humanity™ Arsenal says it all. New Coalition armor, power armor, robots, combat vehicles, and related material. More ways to upgrade and improve your characters. Art by Charles “Chuck” Walton II, Amy L. Ashbaugh, Nick Bradshaw, Mark Dudley, Allen Manning, Brian Manning, Apollo Okamura, Benjamin Rodriguez, and others. 96 pages – $16.95 retail – Cat. No. 893. Summer release. In final production. Final page count and price yet to be determined, but probably 160-192 pages – $20.95-$24.95 retail – Cat. No. 890. Fall release. Final page count and price yet to be determined, but probably 96 pages – $16.95 retail – Cat. No. 892. Fall release. The Republicans decide to make their move while Archie Three is waging his own shadow war against the demonic invaders. The result unleashes a menace Archie has kept contained and locked away for 300 years. And he is not happy about it. More secrets and information about the Republicans. More insane adventure opportunities, strangeness and fun. The new rules, powers and abilities for Haunted Tech will blow your mind. Haunted Tech gives new meaning to “ghost in the machine.” But are they a godsend or a Pandora’s Box of new dangers? The Republicans reveal themselves and take action! Yes, that means Chaos Earth® NEMA O.C.C.s, robots and technology in Rifts® Earth. Archie Three takes action behind the scenes, in a big way. Art by Charles “Chuck” Walton II, Mark Dudley, Allen Manning, Brian Manning, Benjamin Rodriguez, and others. Written by Kevin Siembieda with help from Charles Walton II. 96 pages – $16.95 retail – Cat. No. 894. Fall release. Final page count and price yet to be determined, but probably 96 pages – $16.95 retail. Cat. No. 475. A Fall release. 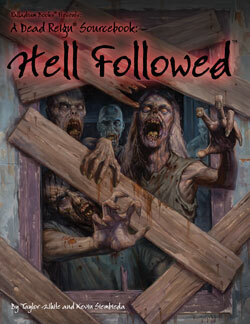 At 160 pages, Hell Followed™ is the largest Dead Reign® sourcebook yet. Artist Nick Bradshaw is already fast at work on the art. Cover by E.M. Gist is finished. Can you survive the Zombie Apocalypse? Find out by playing the Dead Reign® RPG series. This post-apocalypse setting is only picking up steam and is about much more than just killing the walking dead. And future sourcebooks are about to get scarier as they delve deeper into the survivor camps, Death Cults, the new world order, and human heroes and villains. 10 new types of zombies. US government’s response to the Zombie Apocalypse. 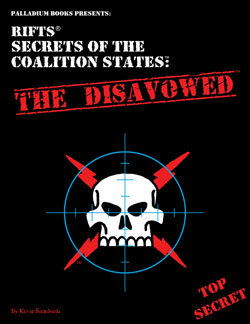 Government enclaves and survivor camps. More world information, new dangers and new adventures. Written by Taylor White. The biggest Dead Reign® sourcebook yet. 160 pages – $20.95 retail – Cat. No. 236. October 2016 release. In final production. 96 pages – $16.95 retail – Cat. No. 665. Winter release (tentative). The Wolfen Empire is growing. And that means trouble for humans, Dwarves, and other people as the Wolfen flex their military might and begin to study magic in earnest. The Wolfen Empire™ sourcebook provides insight and history about the Wolfen, their past, present and goals for the future. The Wolfen are poised to become the next great civilization, but at what cost? Six fleshed out adventures plus a 101 adventure ideas table give players and Game Masters plenty of material for exploring the Great Northern Wilderness and encounters with the Wolfen. The 12 Wolfen Tribes, their history and legends. The Wolfen Empire, its economy and civilization. Wolfen Military, rank, position and plans. Geography of the Wolfen Empire. 13 notable creatures of the North. 101 Adventures Table and numerous other Random Encounter Tables. 6 fleshed out adventures across the Great Northern Wilderness. A few infamous towns, villains and notable people. Cover by Ramon K. Perez. 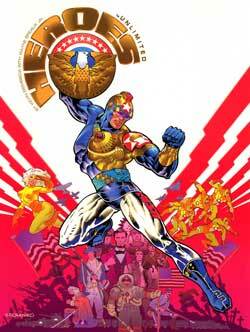 Art by Perez, Johnson, Talbot, Williams and others. Written by Erick Wujcik, Kevin Siembieda & Bill Coffin. 160 pages – $20.95 retail – Cat. No. 471. Back in stock July 6. All of it provides Game Masters with bad guys and ideas for adventure, because each description presents the villain’s origin, motivation and goals. Just drop ‘em into your campaign and watch the super abilities fly. 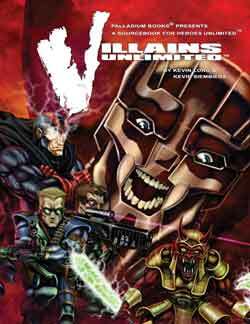 That’s why Villains Unlimited™ has been a fan favorite for years. S.C.R.E.T. stands for Superbeing Control Retrieval and Elimination Teams who are part of a multi-national organization to handle the “superhuman problem.” Are they hunting your heroes? 224 pages – $24.95 retail – Cat. No. 501. Back in stock July 6. 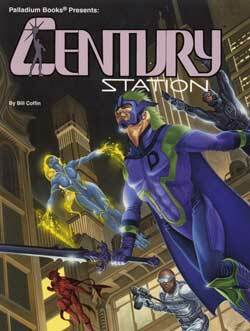 Century Station™ is a compelling cityscape described and mapped. It is a great location to base a Heroes Unlimited™ campaign or a place to visit. The 51 superhuman villains, some of whom are members of villain teams, provide instant antagonists that can be dropped into any game at any time. Likewise, the 40 dynamic heroes can be used as NPCs (Non-Player Characters) or as pre-generated player characters, plus there are weapons, equipment and adventure ideas galore. All ready for you to incorporate into your campaign in an instant. Each villain and hero provides Game Masters with ideas for adventure, because each description presents the villain’s or hero’s origin, motivation and goals. Century Station™ and Villains Unlimited™ are both excellent resources for gadgets, weapons and inspiration for creating your own heroes, villains and conflicts. 51 villains completely statted out. 40 heroes and lawmen to use as NPCs or pre-generated player characters. The District of Century Station, its history, purpose, problems, and notable locations mapped and described. Dozens of gadgets and weapons. Cover by John Zeleznik. Interior art by Wilson and others. Written by Bill Coffin. Additional text by Siembieda. 224 pages – $24.95 retail – Cat. No. 517. Back in stock July 6. Ever wonder what it would be like to play an intelligent, humanoid eagle? What about a sword wielding turtle or ninja rodent, or heroic wolfman, or a flying pig? In After the Bomb® you can turn a mouse into the size of a gorilla, or keep him small and sneaky, but with special animal powers, psychic abilities and human speech and intelligence. Or create that winged humanoid eagle who preys upon criminals. Or maybe that giant hamster, let alone mutant lion or tiger, is an animalistic brute who hunts other mutants (humans and animals!) and feasts upon them like a monstrous predator. The choices are yours. After the Bomb® lets you mutate any animal you can think of, into a heroic crime-fighter set in our modern world or a mutant animal survivor of post-apocalyptic Earth — think Planet of the Apes on steroids. An environment where humans struggle to survive in a devastated (nuked?) world, and intelligent mutant animals appear to be the inheritors of the planet. Fun. Wild. Imaginative stories await. 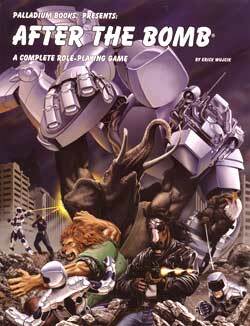 The After the Bomb® RPG and its future world setting is one of the late, great, Erick Wujcik’s most fun and lasting creations. Play it as a stand-alone game or use AtB as a resource to create mutant animals that can be dropped into your Heroes Unlimited™ game, Aliens Unlimited™, Rifts®, Phase World®, Robotech® or just about any game setting. Play them as mutant animals or aliens from another world, heroes or villains, victims and fugitives, but get After the Bomb® because its mutant creations can fit many roles and are a blast to play in any setting. Mutant animal creation rules that lets you turn ANY animal into a mutant with human intelligence, a humanoid body (or not), and super animal powers and/or animal psionics. Art by Kevin Eastman, Peter Laird, Jim Lawson, Ramon K. Perez, Freddie Williams II, Tyler Walpole and others. 224 pages – $24.95 retail – Cat. No. 503. Back in print July 6. Want to play superhumans and caped heroes, mutants and aliens, power armor clad champions and super soldiers? The Heroes Unlimited™ RPG lets you create them all and more. The game is called Heroes Unlimited™ because it enables you to create every type of superhuman and comic book hero you can imagine. Bring your favorite comic book heroes to life or create an entirely hero of you own design. Then weave adventure adventures set in our modern world but one where superhumans, heroes and villains make our world even more exciting and dangerous. If you know and love comic books, you know what happens next. A complete game, all you need to get started is this 352 page rule book, a few friends, dice and an imagination. With several sourcebooks back in stock, and comic book heroes the rage in film and TV, we thought we would remind people about just how awesome the Heroes Unlimited™ RPG really is. Order yours today. 101 super abilities. And many have a variety of sub-powers within them, plus bonuses and special combat capabilities. 100+ magic spells plus enchanted weapons and objects. Wizards and those enchanted and empowered by magic. Mutants with super abilities and mutant animals. 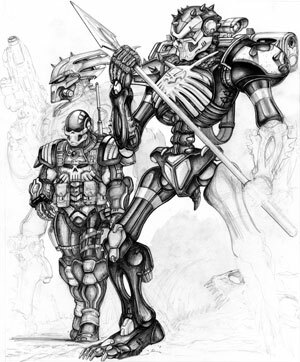 Bionic and power armor creation rules. Robots and super-vehicle creation rules. Super-Soldiers and martial arts masters. Cover by comic book legend, Jim Steranko. Art by Ramon K. Perez, Paulo Parente, Mike Gustovich, Kevin Long and others. 352 pages for a complete RPG – $26.95 retail – Cat. No. 500. Looking for vampire slayers and anti-vampire TW devices? You need to visit Arzno. Arno is a mercenary city built on the edge of the Grand Canyon. It is a force for good, but threatened by the encroaching vampire menace from Mexico who have marked the mercs for destruction. Arzno™ has plenty of fun source material, Techno-Wizard power armor and weapons, a vampire invasion adventure scenario and other adventure ideas. Available from Palladium in book form and as a PDF from DriveThruRPG.com. The City and Territory of Arzno™ described and mapped. A good place for adventurers to trade goods and resupply. The Arzno Mercenary Corps, notable heroes and people of Arzno. 36 Techno-Wizard creations including TW weapons, power armor, vehicles and devices, most designed for combating vampires! The vampire legions of General Zavier Stuart, and the sinister Blood Cult. The ghost-filled forest known as the Waste and some of the monsters found there. The Great Trade Road and many other notable locations. Looking for adventure? Arzno brings it. Cover by John Zeleznik. Art by Walton, Dubish, Breaux and others. Written by Jason Richards. Additional text by Kevin Siembieda. 160 pages – $20.95 retail – Cat. No. 868. Now available in PDF form as well as the printed book! Rifts® Chaos Earth® Resurrection, with all other Chaos Earth® titles to be added in the next week or two. Rifts® Coalition Wars series, the Siege on Tolkeen (all). Rifts® Minion War Crossover series (all to date). Rifts® World Books 1-27 with all the rest coming soon. Rifts® Vampires Sourcebook and other Rifts® titles. Beyond the Supernatural™ RPG and Boxed Nightmares™, 1st Edition rules. Dead Reign® RPG (all titles) – The Zombie Apocalypse. Palladium Fantasy RPG® First Edition Rules and select 1st Edition sourcebooks. 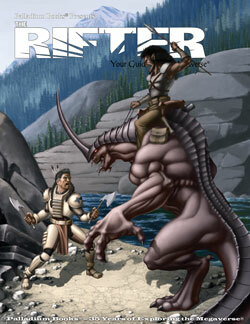 The Rifter® issues 1-66 with more coming. FREE highly-detailed, comprehensive Robotech® RPG Tactics™ assembly instructions for all the Wave One mecha – available now. FREE Robotech® RPG Tactics™ paper game pieces, force organization tables, stat cards, rules and special items – coming soon! Palladium Fantasy RPG® Paper Miniatures – Volumes #1-6 are available now. More are coming. Game Master kits and other resources. 120+ Palladium titles and more, with many more books to come. Go to DriveThruRPG.com to see the full selection. But come back every month to see what new books have been added. We are planning to do a lot. Palladium Books does not have to be an exhibitor at a convention or be counted among the guests to support that convention. We are happy to support events running Palladium games with prizes for best players, other swag, and donations to charity auctions. 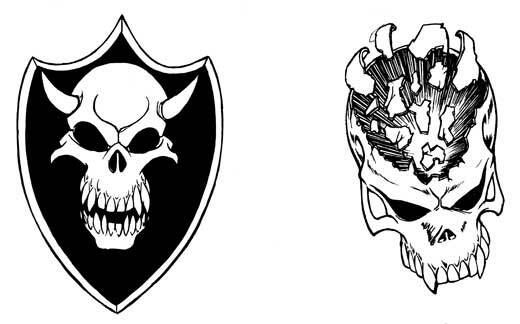 If you are a Game Master running Palladium gaming events, or a convention hosting them, PLEASE contact Palladium Books via the Help Desk or the Megaversal Ambassadors, or call the Palladium offices to get our support. Just give us plenty of advance notice so we can confirm the conventions and the Palladium gaming events, determine the swag and ship it out. Plus we are glad to promote conventions and gaming events right here in the Weekly Updates. Below are just some of the conventions hosting Palladium game events this year. Looking for a nice medium-sized convention of around 2,000 gamers? Then consider GrandCon in Grand Rapids, Michigan. It’s only about 2 hours and 15 minutes from Westland, and even closer for folks living in Livonia, Plymouth, Novi, and cities farther west. Ideal for any Michiganders and gamers living in Illinois, Indiana and maybe even Wisconsin and eastern Iowa. I (Kevin Siembieda) am a guest along with Sean Patrick Fannon, co-author of Savage Rifts® for the Savage Worlds game system, and many other guests. Sean and I will be doing panels about Savage Rifts® and role-playing game design, world building and running gaming events (I’ll probably run Lord DeSilca/Fantasy and/or Beyond the Supernatural), and Palladium Books will have a few tables in the dealers’ room manned by Wayne Smith and Charles Walton II (with artwork for sale). All of us will be present to chat with gamers and sign books. I am thrilled to have a rapidly growing game convention like GrandCon in western Michigan, and they have even bigger plans for 2017. Michiganders, help support this convention. We need and deserve a large gaming convention in our state. © Copyright 2016 Palladium Books Inc. All rights reserved. Rifts®, The Rifter®, RECON®, Splicers®, Powers Unlimited®, Palladium Books®, The Palladium Fantasy Role-Playing Game®, Phase World®, Nightbane®, Megaverse®, The Mechanoids®, The Mechanoid Invasion®, Coalition Wars®, Chaos Earth®, Dead Reign®, and After the Bomb® are Registered Trademarks of Palladium Books Inc. RPG Tactics™, Beyond the Supernatural, Coalition States, Heroes Unlimited, Ninjas & Superspies, Minion War, Mysteries of Magic, SAMAS, Savage Rifts®, Thundercloud Galaxy, Three Galaxies, Vampire Kingdoms, and other published book titles, names, slogans and likenesses are trademarks of Palladium Books Inc., and Kevin Siembieda.